It wasn’t the first time I had been the DJ in a huge arena setting; in fact, I have done this on many occasions through the years. 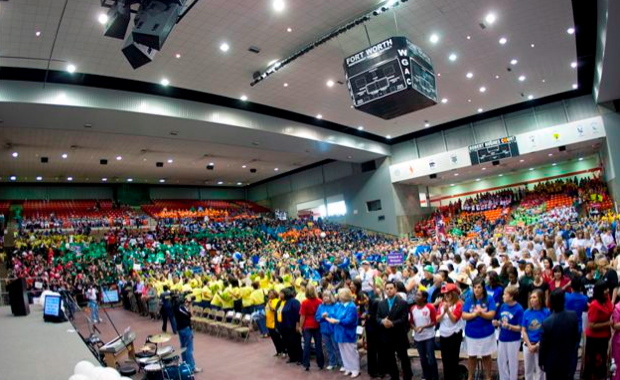 This was my 3rd year to DJ for the FWISD Teacher Convocation. A full three seconds later, we heard the responding “HELLOOOO!” Ah, yes, the arena sound experience! Nothing quite like playing for a group of 3,000 friends! Annual gathering of 3,000 good friends in the Fort Worth School District. My job is to entertain the teachers and staff from ALL the Fort Worth public schools for the hour before the program begins. Schools are seated by section, with everyone wearing their school colors and sporting signs and banners. Many also have props and noisemakers. We keep the energy level high with crowd-pleaser songs, and get everyone up and dancing in the aisles. Cheerleaders and mascots from area schools jump in to ensure vigorous participation. We encourage healthy competition between the schools, and they respond with loud enthusiasm. The theme this year was “Believe,” and schools would be asked, “Do You Believe?” and the response was thunderous. After the morning session concludes for the Elementary Schools, we do the whole thing over again in the afternoon for the Secondary Schools. 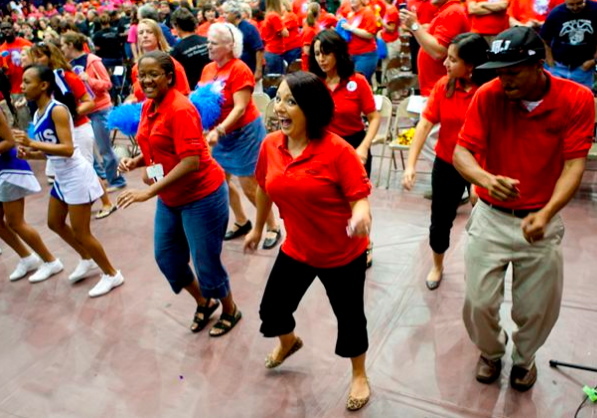 Fort Worth Teachers bring it on! I introduce the program speakers, and they start with introductions and awards for the highest-achieving and most improved schools. 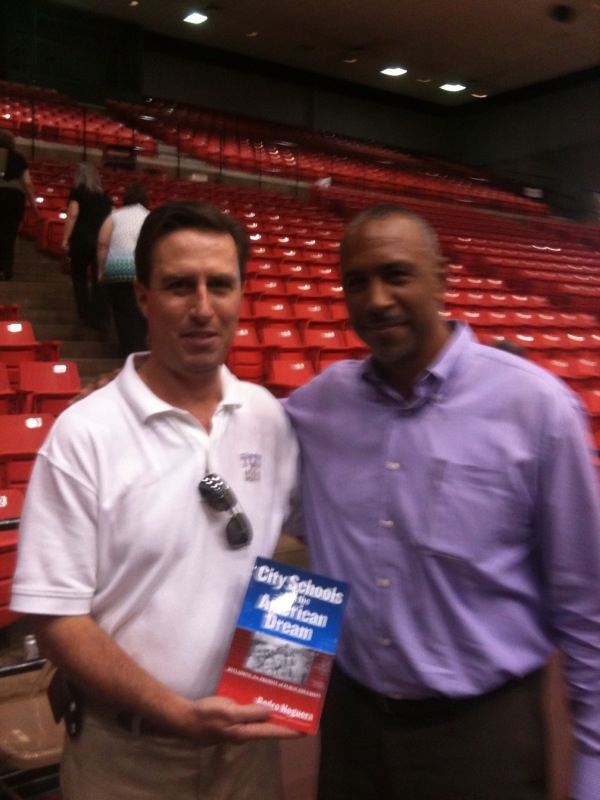 This year I was particularly impressed with the keynote speaker, Dr. Pedro Noguera from NYU. I liked his thoughts on education so much, that I bought his book, City Schools and the American Dream, and had him sign it for me. I am a BIG believer in quality public education for all people, and the Fort Worth ISD under Superintendent Melody Johnson is working to become the best urban school system in America. I believe they have the people and the resources to actually do it. I believe in our teachers. I believe in our students. NOTE: At Party Machine Celebrations, we believe in our school system enough to support it. Each year we donate a FREE school dance to the school with the most successful United Way campaign, and we also offer discounted rates and free add-ons for all FWISD groups! I was contracted to play at a party to honor the contestants in the Van Cliburn International Piano Competition. The party was held at the beautiful Eagle Mountain Lake home of Dr. Bill Bonnell. The house sits on a high bluff with a magnificent view. It had been featured on the cover of an architectural magazine, as an exemplary Texas-style waterfront home. It was a beautiful spring day, the kind where everyone just feels great to be alive. The air was charged with a vernal energy. My assignment was to play music to entertain some of the greatest musicians in the world. The contestants were highly trained piano students from many countries, and their lodgings were in private homes owned by Cliburn competition sponsors. It was an honor to host a Cliburn competitor in your home; in Fort Worth society, it meant you had arrived. Despite the auspicious nature of the guests and the awe-inspiring surroundings, the party flowed as most great parties do. I had worked in plenty of fine homes and beautiful locations, and had entertained my share of public figures. It was just another day at work, and I am not one who is easily starstruck. Then I saw him, The Man himself, Van Cliburn, considered by many to be the world’s greatest piano player. I actually felt myself getting a little nervous as he strolled toward me in my DJ booth enclave. He had a graceful elegance in his movements that was both distinctive, and yet completely natural. This was not like meeting professional athletes, entertainers, or politicians. This man was the Best in the World at his job, and I was, indeed, starstruck. He introduced himself humbly and politely, as though it was he who was the one who was meeting the famous star. Then he gently shook my hand. “Gently” is the key word here. I am accustomed to meeting people, and schooled in the theory that a man should have a firm handshake. Firm, but not too tight, nothing is more unsettling than some jerk who tries to crush your hand, in what is supposed to be a gesture of friendship. But a gentle handshake? Then it hit me: This man’s hands are probably insured for millions of dollars! These are some of the most gifted hands on the planet. I hope that Mr. Cliburn didn’t think I was one of those hand-crushing guys! Former Party Machine DJ Wins an Emmy® Award! The Academy of Television Arts and Sciences recently awarded former Party Machine DJ Craige Bandy the 2008 Emmy® Engineering Award for developing an innovative new overhead camera jib. Craige accepts the Engineering EMMY for 2008. Craige worked as a Party Machine DJ from 1978 until 1986, when I decided to “go solo.” After that, I still referred my overbookings to Craige, knowing that he always did an outstanding job for Party Machine clients. Craige and I shared the same philosophy of always seeking better ways to do things, as well as being gadget freaks of the highest order. Like so many inventors, Craige was a tinkerer, always building things and re-building them, until he is finally pleased with the outcome. It was this restless perseverance that earned him an Emmy®. Craige started TriCam Video in 1986, and experienced early success with forensic video for the legal profession. Never one to rest, nor to be happy doing the same thing for very long, Craige built his own mobile video production trailer, and went on the road doing TV sports, award programs, and special events. Sports like boxing and martial arts offered special challenges for camera operators. Craige saw the need for being able to have a camera overhead, that could swivel 360 degrees around a boxing ring, move smoothly, and zoom in close. This would require a lightweight, remote-controlled camera and a robotically controlled jib crane. Not satisfied with anything that was available, he decided to build his own. Early prototypes were crude, but effective, with later versions being sleeker, smaller, and more controllable. Concerns for safety and reliability forced some components to be machined from titanium, and others to be fabricated in lightweight carbon fiber. Working with his brother Ed Bandy, who brought in aerospace industry knowledge and experience, they raised overhead camera jib technology to soaring new heights (sorry, just couldn’t help it!) See this high-tech invention here. Craige operates several 360 Overhead Jibs in his mobile production business, and he has sold units to ESPN and FOX Sports. The 360 Overhead Jib created new Point Of View applications for entertainment video, and was used in the 2007 CMA Awards broadcast and the Concert For Katrina, among other stage applications. Before being an innovator in TV and video production, Craige began his DJ career at Six Flags Over Texas, and spun records (remember them?) in several area nightclubs including Tiburon in Arlington and Papagayo in Dallas. His DJ business was called Good Times Discos. Craige lives in Grapevine with his wife Stasia and son Cole, who wants to play Major League Baseball. In his spare time he enjoys tennis, golf, sailing and travel, and has an un-healthy interest in extreme sports. Craige enjoys coaching Little League baseball. Back in the day when Dallas Cowboys stars Harvey Martin and Ed “Too Tall” Jones used to show up at our Party Machine events, they often had a friend in tow, who was not an NFL player, but still a celebrity (and a playa) in his own right. “Crazy Ray” (whose real name was Wilford Jones, no relation to Too Tall) was the unofficial, but sort-of official mascot of the Dallas Cowboys, and certainly their biggest fan ever. From the inception of the Cowboys franchise, until his death in 2007, it was said that Crazy Ray missed only 3 Cowboys home games. Although not officially on the payroll, the Cowboys did provide Ray with an all-access pass and parking permit for home games. He was part of Cowboy fan culture. Perhaps Ray’s best performance as an unofficial mascot was when he would clown around and wrestle with the Washington Redskins unofficial mascot, Zema Williams. He was known for his western-style outfits, often wearing chaps and a vest with a ten-gallon hat, and for entertaining the fans with magic tricks. He had a whistle that became a trademark, letting the fans know that “Crazy Ray is here!” and was often seen galloping on a little toy stick-horse, always a comical sight. Ray stopped galloping after losing a leg to complications from diabetes, and ultimately lost his battle with heart disease at age 76. Our hats are off to you, Crazy Ray! Party on!